To celebrate being 6 months into regulated cannabis in California, we are bringing together two of the most important people in the cannabis industry for a classic fireside chat. 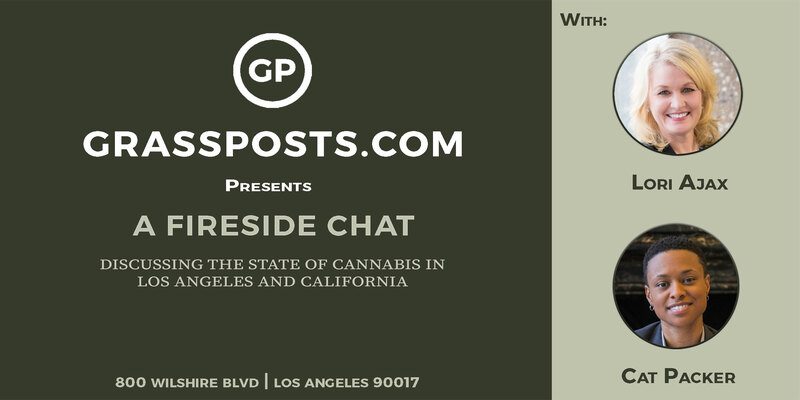 On June 13th in downtown Los Angeles, Chief Lori Ajax and Executive Director Cat Packer will join us for an evening discussion about the state of cannabis in California and the largest local market Los Angeles. The transition from a unregulated to a regulated industry has had its hurdles and overcoming them has been of the utmost importance for the industry. As we continue to overcome these hurdles and improve the state of cannabis in California, learning from the past to improve the future is what is most important. If you are interested in being a volunteer or an exhibitor at our event, please send an email to johnny@grassposts.com. This is a non-consumption event. Appointed by City of Los Angeles Mayor, Eric Garcetti in August of this year, Ms. Cat Packer serves as the city's first, Executive Director of the Department of Cannabis Regulation. Most recently, Packer served as California Policy Coordinator for the Drug Policy Alliance (DPA), where she worked to ensure the successful & equitable development and implementation of California’s evolving cannabis laws and policies. Within her role, Packer championed responsible regulation, industry diversity and reinvestment in communities most harmed by marijuana prohibition. Prior to joining DPA, Packer served as the Campaign Coordinator for Californians for Responsible Marijuana Reform, Drug Policy Action's social justice driven campaign in support of the Adult Use of Marijuana Act. Packer is an alumna of The Ohio State University where she received a Bachelor's in Political Science, a Master’s in Public Policy & Management and a Juris Doctor. ​In February 2016, Governor Brown appointed Chief Ajax as the first Chief of the newly formed Bureau of Cannabis Control. Prior to her appointment, Chief Ajax served as Chief Deputy Director at the Department of Alcoholic Beverage Control where she spent 22 years working her way up the ranks, starting at the investigator trainee level. Ajax spent ten years in private industry prior to her state government career. She holds a Bachelor of Science Degree in Criminal Justice from California State University, Sacramento. Your enthusiasm and expertise. We are all here to grow and cultivate relationships. So make sure to bring your notebook and excitement to meet new people. ● Take Metro Expo, Blue, Red, or Purple Line to 7th St / Metro Center Station​. ● Use the Flower Street Exit, cross Flower Street, and take a right. ● Our building will be on the left. Look for the FedEx sign. Ride sharing Uber or Lyft are often most convenient for guests attending an event at Cross Campus Downtown LA, as parking in the area can be expensive. Note: The below entities are not owned by Cross Campus; they are suggested options. Hours, prices, and availability are subject to change.